…that is, indeed, the question. Conceiving an idea and embodying it into a tangible form requires a significant effort. It is not a linear process which you can take for granted, and it is essential to reveal the feedback mechanism between the “design” and “production” sequences – we would like to remind this especially for those who are new to the methodology and who have jumped on board with the hype of 3D Printing and robotic manufacturing. We believe the process is crucial as opposed to the cosmetic value of the end product. We have already investigated several examples where we appraise the novel point of convergence of computational form generation and computer aided materialization in our previous issue.1 Now is the time to examine examples who have started off on the wrong foot, but have pivoted at the right time or have the right answers to wrong questions. Print now, worry about it later. Let us remind ourselves again: digital fabrication parallels pre-digital processes for making things. It does not supersede in terms of methodology, as the material reaction is a constant. A person can cut any material with the tools necessary to obtain the same outcome just as a CNC router would carve to produce a digital file. A person can build up clay in an additive approach just as a 3D printer lays down layers of plastic. An embedded design fabrication in the digital platform provides unparalleled precision, scaling, cross-machine capabilities and rapid reproducibility. For a long time, digital fabrication was mostly associated with industrial design due to its limitation in scale. Exporting this methodology for construction industry brings a huge burden; the outcome cannot only be an eye-candy, but it also has to be durable and functional. After all, this is expected from an architectural outcome. Transcending the scale of pure representation of an idea to real-life application is a tedious transition. It is easy drifting away from the original design intention, being awestruck with the wonders of technology. Pivoting from your initial methodology is imperative for the sake of the continuum of the research as the question of scale is recognized. It is a matter of using the right tool and the method. We do realize that most digital fabrication projects do not aim for a direct / practical use at the moment and mostly are experimentations towards a near future. Let us take a glimpse at these experiments of “printing outside of the box” hype, and with one (preferably left) side of our brain, question whether it makes sense to disrupt and existing construction methodology and with the other (right) side experience the bittersweet new flavor. Using a custom 3D editing software, it is possible to develop custom metamaterial mechanisms. Resembling a massive mesh butterfly, the Daedalus Pavilion consists of 48 separate pieces that were 3D Printed using a customized industrial robot with a 3D Printing setup. Covering an area to house several coffee tables, the pavilion was unveiled as part of the GPU Technology Conference inside a gallery space in Amsterdam. Operating in a very thin line between art and architecture, very essential of architecture remains unanswered: functionality. Maybe we should not be looking for functionality in a proof-of-concept for printing a large scale model and it is perfectly fine for blurring the line between art and architecture. Yet, is it not time to contextualize methodology and not just apply the same 3D printing technology developed for prototyping models to architecture? Keeping in mind that the material used remains the same in both scales (thermoplastics), are we really just larger scale industrial designers developing non-functioning prototypes? In terms of size and functionality, the Door Latch Metamaterial project by the team at the Hasso Plattner Institute’s Human Computer Interaction Lab is quite the opposite of Daedalus Pavilion. Metamaterial mechanisms in this example are composed of a grid of silicone cells with different patterns creating varied levels of rigidity, thus flexibility, at places needed. Turning the handle creates a rotational movement that causes the adjacent cells to shear. Shearing makes the latch move inwards, unhooking it from the doorjamb. Using a custom 3D editing software, they first lay down the rigid blocks of the door latch, then introduce the flexible shearing cells around it. The software runs a finite element analysis to predict how the mechanism will react when force is applied to particular areas, such as the force applied when the door handle is pushed. Perhaps, the application of this mechanism is not best suited for doors frequently used. A steel handle and latch will obviously last far longer than a silicone equivalent and can be recycled easily, and far easier to source if you are near any hardware store. However, the idea of a printable moving mechanism is far too intriguing to dismiss and we should seek a context where such property would be more appropriate to utilize. Somethings really should not be rushed. MX3D Bridge designed by Joris Laarman Lab officially kicked off in October of 2015. Announced to be finished in 2017, it is to be built over one of the canals in Amsterdam. The bridge was supposed to be built on site with industrial robotic arms utilizing a MIG welder to deposit layers of metal welding wire. As of this article’s writing, large parts that were printed horizontally are being assembled together. The design needed to change significantly due to regulatory, engineering, and practical reasons. Just as it could happen to any conventional design process, things happen. Nonetheless, it is a bold attempt as opposed to the project led by ACCIONA designed by IAAC in collaboration with Enrico Dini a little down south in Barcelona. It did take the title of first 3D printed bridge ahead of MX3D, but at what cost? Just for the sake of being the first, the city of Barcelona has got itself a pile of concrete that seem to be lumped quickly and distastefully without a concern for quality. Awareness – Mesh Mould plastic/metal. 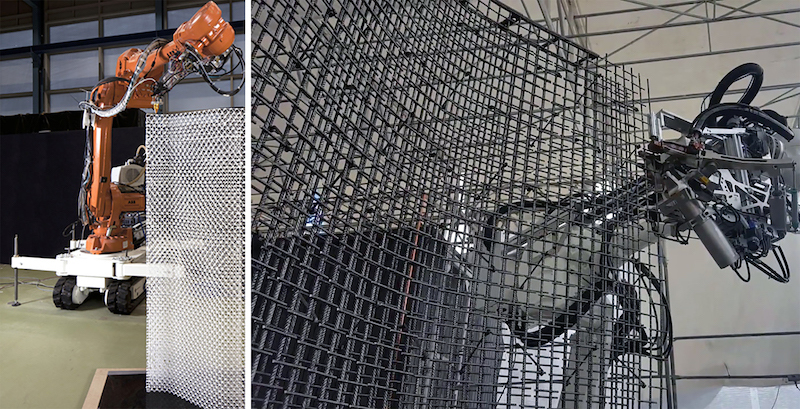 Mesh Mould, the research project by ETH Zurich, addresses the 1:1 construction aspects of robotically fabricated loadbearing structures. The project combines formwork and reinforcement into a single robotically fabricated construction system, and allows fabrication of geometrically complex concrete structures. The first iteration, pursued between 2012 and 2014, utilized a plastic extruder attached as an end-effector extruding thermoplastic polymers in order to create a three dimensional mesh structure, a predecessor to the Daedalus Pavilion in terms of methodology. The concrete mix is then poured into the mesh which acts both as the reinforcement for the concrete and the formwork. Balancing the structural integrity, cells are optimized to be wider in the center to allow for the dispersion of concrete whereas they are optimized to be much denser at sides to prevent concrete protrude out of the mesh. However, the polymer proved to be unsuccessful compared to metal. Thus, they pivoted from spatial polymer extrusion to a methodology which employed an end-effector that could cut and weld specific lengths of metal rod to construct a metal framework doubling as the reinforcement. Their pivot from a mediocre result to the improvement of a proven methodology brought its fair share of success – the team received the Swiss Technology Award in 2016 and they went on to implement the first real-world application at 1:1 building scale in 2017. There had been dozens of projects focusing on 3D printing in concrete, yet they had all treated the problem as if it requires only a bigger scale printer that deposits concrete instead of plastic. How naïve these architects are, how they forget the very basics of material properties and scale simply amazes us. Perhaps Neil Gershenfeld was spot on with his microwave analogy. There is always a hype about a new technology, as seen in the Gartner Hype Cycle. From the moment a new technology is discovered, it triggers hype and peaks to inflated expectations. As trough of disillusionment hits, expectations hit bottom. Only then, we rid ourselves of distractions and we start climbing the slope of enlightenment for the uses of the new technology until we hit the plateau of productivity. The future is neither additive nor subtractive, but rather it is turning data into things. Since the inception of the first computer numerical control back in 1952, what has grown forward is a digital revolution in making things. The way we act on the material and how the material behaves have been constant all along.3 Rather than expecting the new technology or the tool to do the wonders, we should be asking what to do with it. We know the answer to the meaning of life. It is, obviously, 424. What was the question again? For more on the topic, refer to How to Train Your Robot published in 2017 June, XXI. There are, of course, some exceptions such as MIT Self-Assembly Lab’s 3D Printing method developed with Steelcase. We hope you did not think that we would not be referencing the Hitchhiker’s Guide to the Galaxy.